At Fuzzy Math, we don’t like to brag. Well, we do like to highlight our sweet Lego conference table and our office culture, but outside of those, we don’t brag too much. We do our best to deliver high-value and high-quality design services and let our work speak for itself. 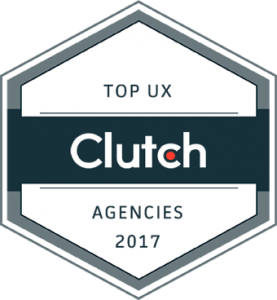 Luckily for us, our incredible clients have spoken up and done some bragging on our behalf, earning Fuzzy Math a top spot on Clutch’s highly respected Top User Experience Agencies list. Clutch is a prominent research and ratings platform located in Washington, D.C., which scours the globe looking for the best-of-the-best firms across the IT, marketing, and design industries. They create leaders matrices that feature the best companies in each category, with the goal of helping small to mid-sized companies find reputable, quality firms to help with their digital needs. Of the 100+ user experience agencies considered, we are ecstatic to have earned the #2 spot! The presentations they’ve developed and that we’ve delivered to our leaders have always been well-received … I think that speaks to how well-designed, clear, and useful their work is. They’re just the nicest designers I’ve ever worked with. They’re smart and eager to jump into a new project. It’s really easy to hit the ground running with them. They’re fun to work with and they do great work. I keep hiring them over and over. I’m super picky, just to put a point on it… Fuzzy Math is really good at giving you what you need. They’re good at cutting to the chase. They’re good at saying, ‘I hear your problem. What you guys really need is…’ They really like to solve the problem well and as elegantly and efficiently as possible. Since the new product launched in December 2015, we’ve added 700 new customers. With new client acquisition and client migration, we’ve had tremendous success with the new platform… I appreciated that Fuzzy Math had a very clear methodology. It was easy to get conceptually behind what they were doing and why they were doing it. It helped us understand where our dollars were going. That was a real strength of their model. The Fuzzy Math team listened well and incorporated the input and experience of our team into their deliverables…. As something of an unintended outcome, our team’s practices improved through osmosis – we learned from their approach and have incorporated many of the techniques they used during our project. So we’re bragging a little here, but we’re beyond proud to be at the top of the list. We wouldn’t be there without the fantastic group of people in the office every day, and of course, we wouldn’t be where we are today without the support and trust of our awesome clients. Together, we’ll keep pushing the envelope and making incredible projects that are worth bragging about. To read more comments from our clients and to see other projects we’ve worked on, visit our Clutch profile.